This week was Amanda Schuber’s last week with Habitat for Humanity as the Family Services Manager. As word started to leak out last week with Amanda’s departure, homeowners, partner families board members, and volunteers she has worked with over the past ten years, have been coming into the office to say thank you, usually leaving with a tissue to help dry eyes. 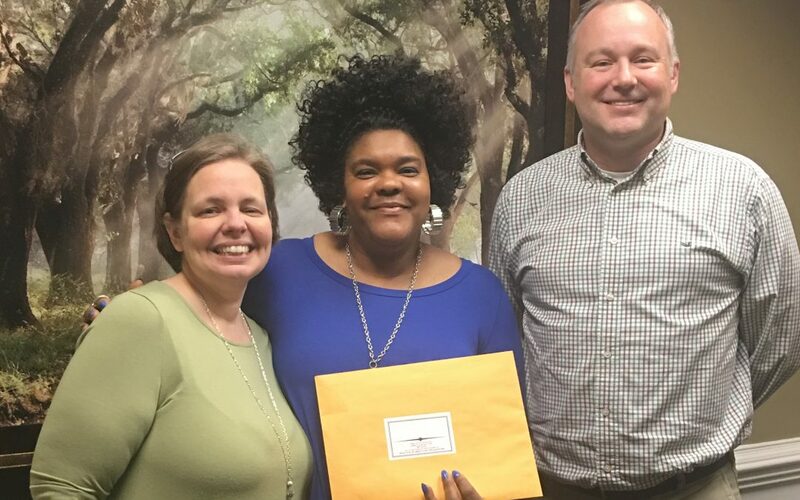 This week she was able to celebrate two families becoming homeowners as they closed on their homes (Pictured with Donna Price above). In June of 2008, Amanda Schuber joined Habitat for Humanity of Madison County’s staff as an Americorps VISTA. She was one of tens of thousands of Americans who have joined Americorps to serve her country and its citizens in the most need. Amanda worked with our Family Services staff to conduct a review of the Habitat program in Madison County, how the families we have served have benefited from the program, and how we can make our program stronger to better serve our partner families and the community. After two years with our affiliate, Amanda helped implement a number of significant changes to the education program and new systems for Habitat partner families working to become homeowners. With her term with Habitat coming to an end in June of 2010, Habitat offered her a position on staff as a Family Services Coordinator to continue the amazing work and programs she had established. The education program she help created has grown to one that now includes 55 hours of homeownership and financial literacy programs. We now offer Dave Ramsey’s Financial Peace University to every family coming into the Habitat program. She has lead classes on resolving issues with neighbors (always telling the story of her neighbor’s goats), showing how to maintain a yard (demonstrating how and making each homeowner pull weeds), how to improve their communities, working one-on-one with each family on their budgeting skills, and so much more. The Habitat program is not easy for any family trying to get a home. Each family has to complete 350 hours of sweat equity helping in our ReStore, building homes with our volunteers, and helping out at other area non-profits. They have to attend classes in the evenings and weekends. This is on top of having jobs, sometimes more than one, and caring for a family. This is not a give-away program! It is often said that Family Services staff are part educator, part loan officer, part counselor, and part cheerleader because the number of roles they have to fill to walk with the families as they go through this program. Amanda, we love you and will miss you. We know you will not be a stranger. We pray for amazing blessings and experiences in your new endeavor. Godspeed and God Bless! Habitat for Humanity of Madison County is an ecumenical, grassroots Christian housing ministry that seeks to eliminate poverty housing from our community, and make a decent shelter a matter of conscience and action. Since 1987, nearly 280 families in Huntsville and Madison County have been served through the new construction, rehab and repair program. Please join our ministry with a donation to Habitat so we can help continue to provide opportunities for families in need in Madison County. Click here to donate.